Old Oswestry has only been excavated once, in the years 1939/40, under fairly trying circumstances. The dig was conducted quite literally on the eve of World War II, the ramparts were still wooded, undergrowth was thick, and the underlying gravel layers misbehaved at the first hint of disturbance (2). Varley was wont to reinterpret his own findings over the course of his life, which is desirable, but never published them, which is not. Though details of his interpretations were printed here and there, the full report only saw the light of day in 1994, when Gwilyem Hughes organised its posthumous publication in the journal of the Cambrian Archaeological Society under the title of Old Oswestry hillfort: excavations by W. J. Varley 1939–1940. More recently a detailed earthwork survey and interpretation of the site and excavation records was undertaken by Nicky Smith on behalf of English Heritage. Given the conditions of the original excavation, the unusually lengthy gestation period of publication, and the lack of any subsequent excavations at the site, there is still some confusion about the chronology of construction work. The interpretations of the venerable hillfort explorer A. H. Hogg, as expressed in his Hillforts of Britain, were used as a basis for the following description, with Nicky Smith’s invaluable work providing welcome paths through any remaining confusion. This is, none-the-less, the simple version of events. 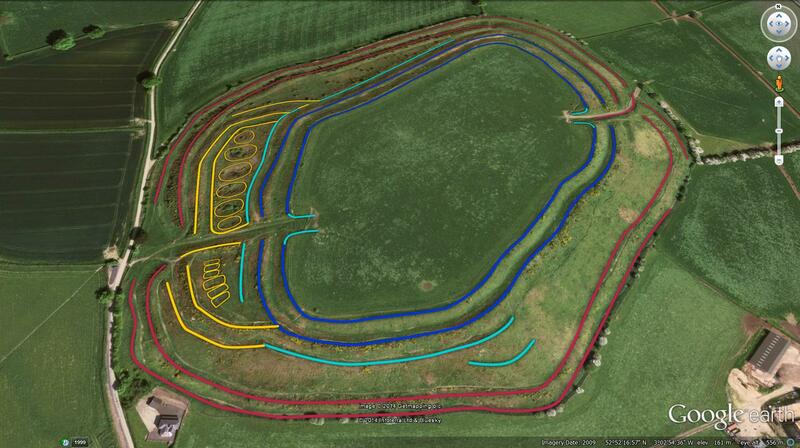 Old Oswestry Hillfort Period 2. Well here’s where the confusion begins. Although ‘Period 1’ at Old Oswestry refers to the earliest phase of the hillfort construction, it seems that the hillfort was preceded by a Late Bronze Age palisaded enclosure which contained a number of roundhouses. So although there was activity at the site, and in fact an early enclosure, Period 1 refers to the earliest part of the hillfort – the hilltop itself was occupied by a number of roundhouses. These had been abandoned for long enough to become turfed over before the first two ramparts were built. The innermost rampart was around 3 metres thick, and revetted with stones on the exterior and interior. The second rampart was of a ‘dump’ construction – that is, it consisted of soil and gravel with no exterior structures. Both ramparts were fronted by ditches. The interior of the hillfort at this point contained roundhouses again, but this time constructed of stone. Iron Age ‘A’ pottery was discovered under the hearth of one of these houses, which would suggest an Early Iron Age date. This is backed up by the simple entrances, which are common in this period. Old Oswestry Hillfort Period 3. Old Oswestry Hillfort Period 4. Old Oswestry Hillfort Period 5. 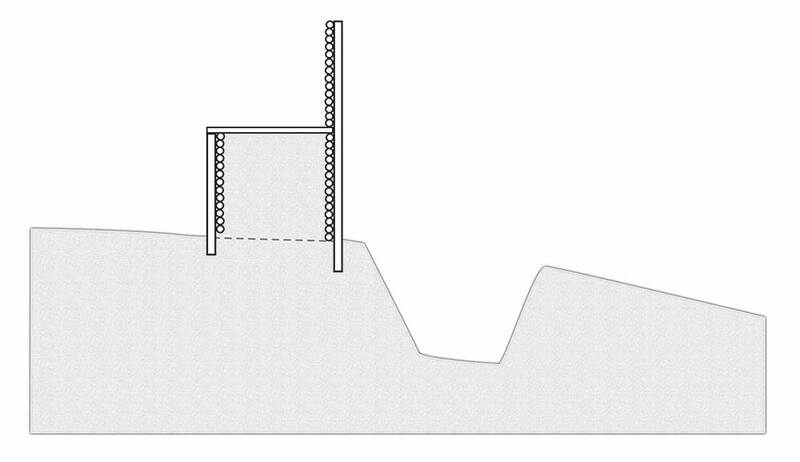 Old Oswestry Hillfort Western Ramparts Profile. COLOUR THESE IN THE SAME COLOURS AS THE PICS ABOVE. Old Oswestry hillfort is an Early Iron Age multivallate enclosure of around 40 acres (16.18 hectares). The two main entrances – one in the east and one in the west – are original. The ramparts in front of the western entrance contain a number of huge rectangular pit features which are unique amongst British hillforts – no-one knows what they were for, but suggestions have included cisterns (though they hold no water), stock enclosures (though there are no entrances), storage pits (unlikely), and inevitably, once the practical options have worn thin, ritual structures. The most pragmatic suggestion has come from Hogg, who says that it “may be that they were designed solely to protect and define the very long entrance passage, and that the space within served no practical purpose but was not worth the labour involved in refilling.”(1). This explanation is a little more persuasive than the other offerings, but also fails to land a final blow.